A Piercing Line is a two bar formation that develops after a down leg with the first bar continuing a move down with a long red body. The next bar forms by opening at a new low then closes above the midpoint of the body of the first bar. This price action produces an up bar. 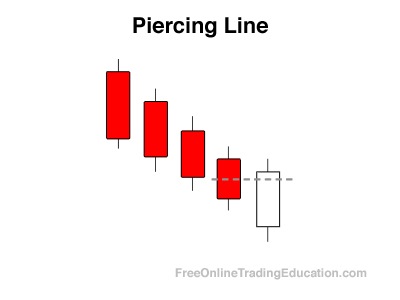 Technical analysts often use the Piercing Line candlestick pattern to start working their way into a long trade. Most traders need this to form in context with another bullish trade setup as additional trade confirmation.